An abusive marriage, an unsupportive family, struggles as a single parent followed by the loss of a daughter. Ajeet Cour’s autobiography follows in the footsteps of Mallika Shaikh in narrating the life and problems of a woman writer. Unlike Shaikh, she chose to leave her husband altogether and face life on her own terms – which was not easy given the state of conservative Indian society at that time. She also had the courage to walk out on domestic abuse something that, according to the experts, even the strongest of women find hard to do especially in a patriarchy like India. Those looking for the story of the success of a Sahitya Akademi award winning author will be disappointed – Weaving Water has very little to say on Cour’s craft. Instead it throws the doors open wide on her unhappiness and her struggles. Cour grew up in pre-Partition Lahore, with an irregular kind of education. Significantly, she starts the book with the birth of her younger brother, an event of great importance in a Punjabi family where sons were the hallmarks of generational continuity. Her father was autocratic and uncaring, her husband unloving and women to them were worthless beings – and Cour was even more so because she could only bear daughters. Cour’s fame as a writer only came later after her father was dead, so one can only speculate on what he might have felt. She refers to herself as ‘a mutilated falcon’ sitting on a barren tree branch. Cour writes with stark simplicity straight from the heart. Love in her life proves fleeting. Her anguish at losing her second daughter Candy is palpable. She chose to view everything that happened to her as a turning point. In fact Maya Angelou’s ‘Still I rise’ could well be her anthem. Despite being a novelist, it took her quite a while before she could find her own space. She ran a school for slum girls in the flat that her father Daarji bought for Candy. Luck, or fate, brought her into contact with Indira Gandhi and, with Gandhi’s help, she started a vocational school after being alloted a plot of land near Siri Fort. 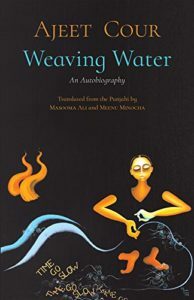 Weaving Water captures Cour’s loneliness and highlights the fact that this autobiography is her attempt to write out her sufferings sometimes without even being aware that she was doing it. The title itself speaks of impossible tasks accomplished. Of course, since the book is a translation we must take its fidelity to Cour’s original language for granted – though the translation is vivid in itself.